Four new members of the El Paso County Department of Public Works team graduated Thursday, April 26, 2018 from the Entry Level Maintenance Worker Training Program. 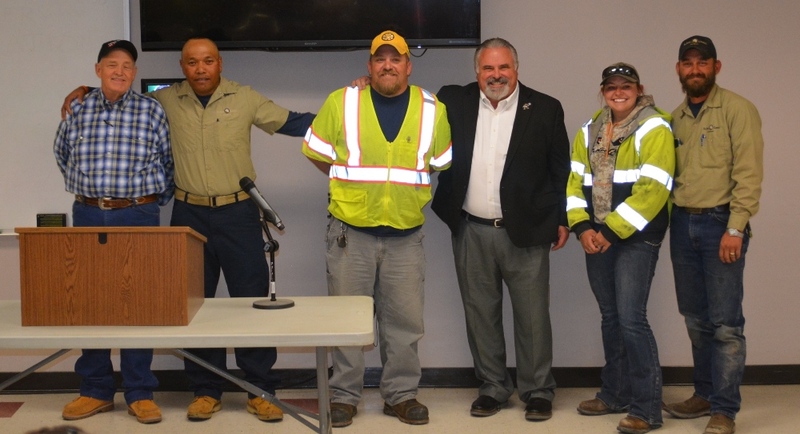 Darren Snow, Jason Schuck, Kesomi Moala and Siobain McClure were celebrated by the Department of Public Works at a graduation ceremony at the Charles C. “Chuck” Brown Transportation Complex on Akers Drive in eastern Colorado Springs. They were presented with certificates, an El Paso County team hat and a caking after the ceremony. The four graduates completed the 6-month program that included 340 hours in the classroom,120 hours of hands-on heavy equipment training and 680 hours of crew specific on the job training, They are now full-time maintenance workers and have each been assigned to a crew. The Entry Level Maintenance Worker Training Program began with its inaugural class in March 2016.